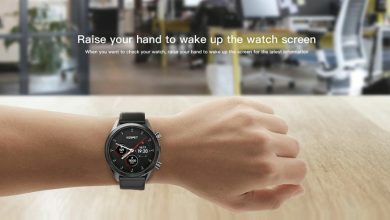 XiaomiToday is undoubtedly a place where you can find everything, from the latest technology trends to the latest in fashion thanks to the diversity of products of large Asian companies, today, Meterk brings you a new offer, the Rangefinder Portable Laser Meterk MK60. 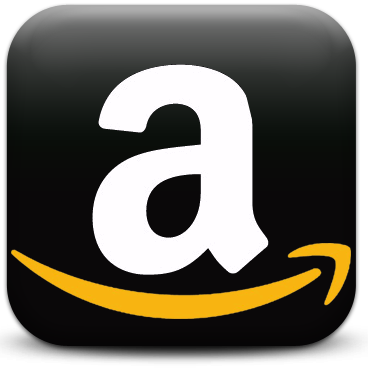 Which is on sale with a 25% discount only by Amazon. Meterk is a brand that offers a wide variety of tools of all kinds, with an excellent quality and price ratio. This company is responsible for providing a series of professional equipment at an affordable price. This great company is always open to receiving reviews and opinions from users since its policy allows to interact with the consumer in order to improve the quality and the shopping experience. Have you ever wanted to be able to measure long distance without trying so hard? Well, today we have the solution to this need with the Meterk MK60, with it you can measure large distances, the area, and volume of a given site in less than a minute. A tool that fits easily in the palm of your hand and the best thing is that it is a fairly light device that is easy to transport. In the next section, we will know each of the details of the Meterk MK60 Portable Laser Rangefinder, without a doubt this new tool will surprise us with a magnificent display of features. The Meterk MK60 Portable Laser Rangefinder has an incredible design, this product has a rectangular body with semi-rounded corners with dimensions of 11.1 x 5 x 2.5 cm and a weight of 101 grams. It is available in black with orange stripes, the buttons are mostly black and two of them come in red. ABS and TPE are manufactured in addition to optical lenses to guarantee a unique quality and durability. 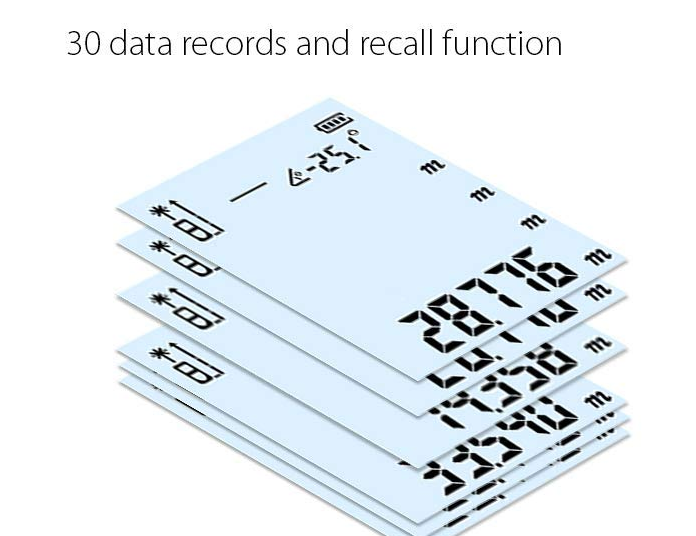 The device has a multiline LCD screen to be specific to 4 lines, with backlighting. 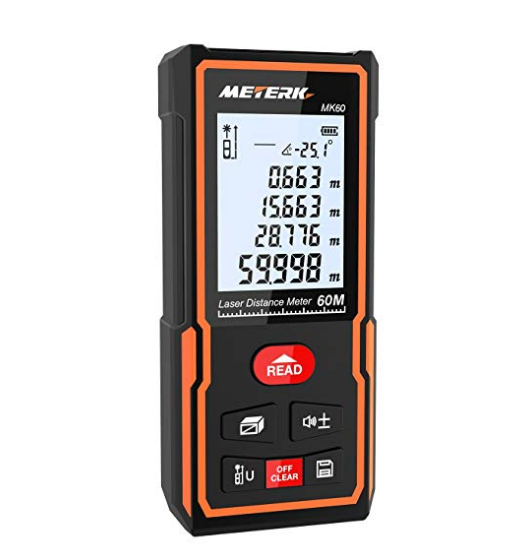 The Meterk MK60 Portable Laser Rangefinder is a measurement tool, it can be widely used in buildings and industries, especially in large areas, such as rooms, apartments, buildings, properties, warehouses, among other buildings. It is a very easy tool to use since it quickly orientates thanks to its high precision laser pointer. It is a meter that responds at a speed of 20 seconds to give the specific measurement, with just pressing a button you can obtain the distance and the exact volume of a certain area. 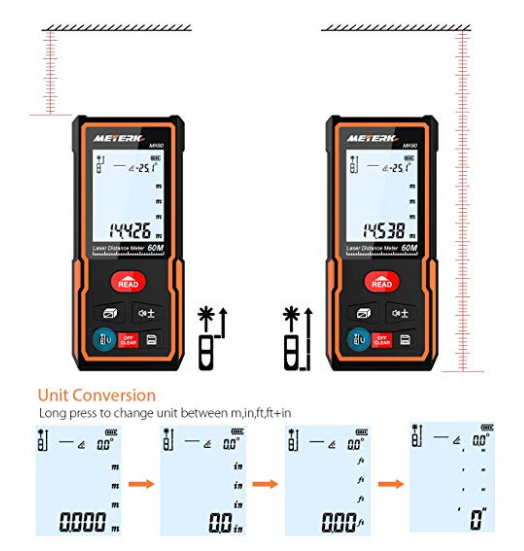 It works with different units that can be exchanged between meter (m), inch (inch) and feet (ft), it has a maximum range of up to 60 meters. This device works with two AAA batteries that have to be purchased after its acquisition, it also has an automatic shutdown system that after 150 seconds of inactivity will be turned off to save battery consumption. 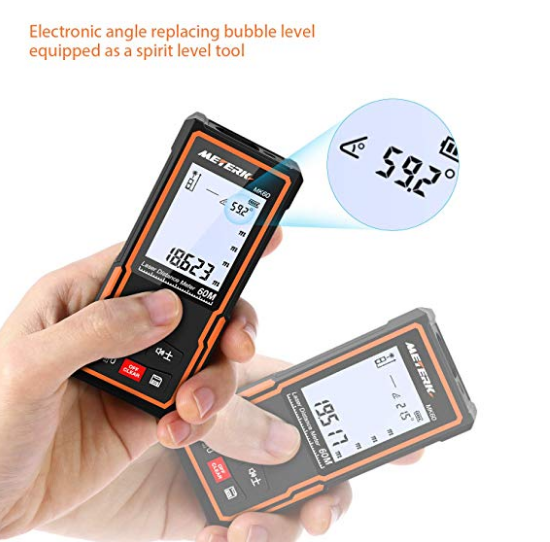 If this product of the Meterk brand has captured your attention, we recommend you take advantage of the offer that is valid only by Amazon with a discount of 25% with the purchase of the Meterk MK60 Portable Laser Rangefinder for only $17,03 (€14.99) just apply the coupon FQZSVM6D, which means a good reduction compared to its initial price of $22.71 (19.99 euros), but it is our duty to inform you that this offer will not last long and it is necessary to hurry since the discount It is valid only for the first 50 users to use the coupon, with a deadline for this next November 15.